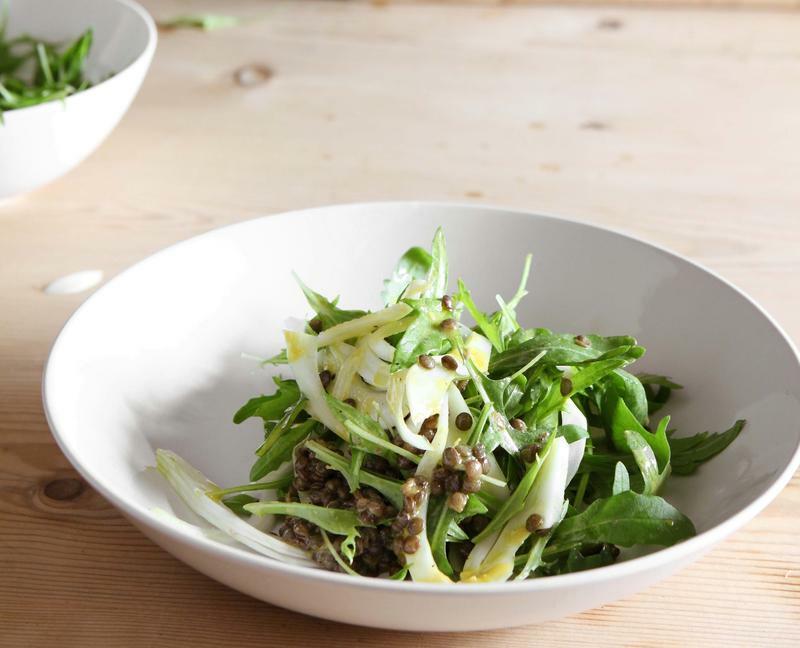 Rocket has become such a ubiquitous leaf, so often thrown into generic mixes of salad leaves, that it’s easy to forget how well it shines solo, or nearly solo. Combined with the delicate aniseed note of fennel, some earthy lentils and a lemony dressing, it really comes into its own. Adding a few other peppery leaves also works well. With some good bread, this simple assembly is a supper in itself. It also makes a great starter. Put the lentils in a saucepan and add plenty of water. Bring to the boil and simmer for a minute only, then drain. Return the lentils to the pan and pour on just enough water to cover them. Add the bay leaf, onion and parsley stalks, if using. Bring back to a very gentle simmer, and cook slowly for about half an hour, until tender but not mushy. Meanwhile, to make the dressing, shake all the ingredients together in a screw-topped jar until emulsified. When the lentils are done, drain them well and discard the herbs and onion. While still warm, combine with a good half of the dressing. Leave until cooled, then taste and adjust the seasoning; you could add a little more salt, sugar, pepper or lemon juice if needed. Trim the fennel, removing the tough outer layer (unless they are young and very fresh). Halve the bulb(s) vertically, then slice as thinly as you can, tip to base. Pile about two-thirds of the lentils into wide serving bowls. Scatter over the rocket and fennel and trickle over the rest of the dressing. Scatter over the remaining lentils and serve. Who needs meat? During the River Cottage Veg cookery course you'll learn to turn local, seasonal produce into delicious veggie dishes.